We’ll set the scene by Robin Duckett briefly introducing Sightlines Network Principles, so that you can see where this work is heading, what kind of attitudes, practice and experiences we are trying to foster. The morning’s presentations are from the London Network, which Solveig Morris, ex headteacher and local advisor, will introduce. “The Language of Photography” The London Network conducted an in-depth study into this media language, and in particular Eloise Robinson worked closely with the focus for a long time. She is currently finalising a new Sightlines publication on this, and will be delighted to present some of the project’s experiences and learning – of the children and of the adults. Where’s the Thunder Coming from? Rosie Egena and Linda Brown, of Lewin Pre-school, a pack-away voluntary preschool in Streatham, describe some of their adventures into listening to the children, the changes in their practice and their children’s deep learning, since their attendance at last year’s network Showcase Day. 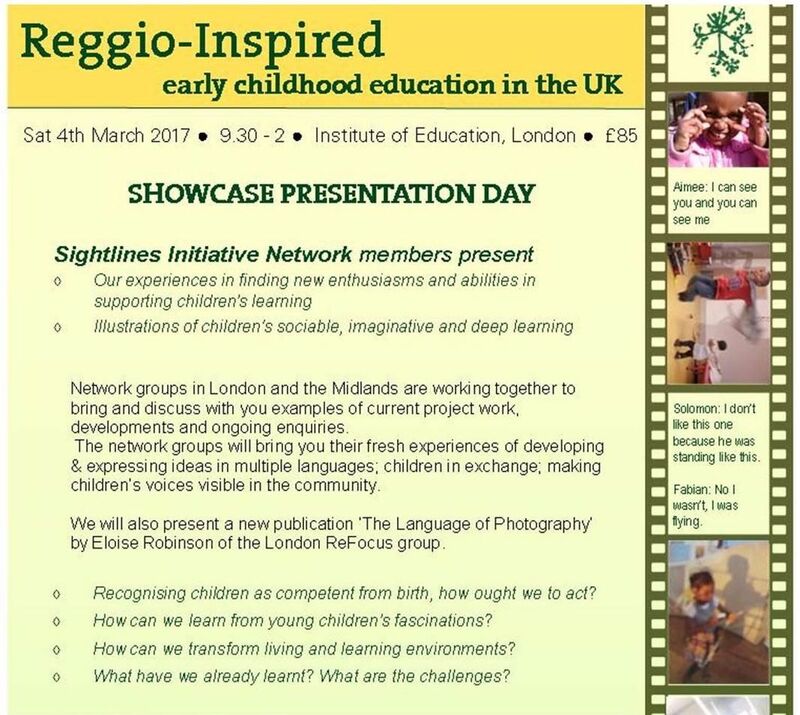 Kate Cowan, lecturer at the Institute of Education, will discuss the London network group’s exploration and learning on the enriching of children’s enquiries through the interplay of multiple languages (photography, drawing, sculpture, etc), environments and children’s exchanges. Nicola Turner and Camilla Alton of Balham Nursery School, with Eloise Robinson, will then present their learning, broadening out their enquiries after focussing on their documentation and reflection. Their example involves a group of children using an ipad and video technology. will begin with a brief reflection on our beneficial relationship with our colleagues in Reggio Emilia, and the importance of the network’s learning in the current political –educational climate. The afternoons’ presentations are selected from settings of the West Midlands network, introduced by Louise Lowings and Nicci Burton. ‘Supporting emotional resilience, and deep exchange in a learning group’. This is an important consideration which Nicci Burton of Bedworth Heath Nursery School, and Andrea Clarke of Hillfields Nursery School will discuss through their recent experiences with their 3-4 year olds, and 2-3 year-olds. ‘Transforming an environment to promote children’s thinking and ideas’. How we created a stimulating, calm and reflective environment, inspired by the natural world: Emma Weston and Jane Charman of Short Wood Primary School. Learning to Listen: Our first steps into documentation: Morda Preschool, Monmouth and Bonny Bundles Preschool, Telford. ‘I can hear you and you can hear me’: making a place where children listen to one another/Acting on understanding children as sociable and competent. The staff at Madeley Nursery School have become aware that there are aspects of their environment, and their own habits as educators, which need re-constructing in order to maximise children’s autonomy, and self-reliance. Through examples, they will discuss how this learning process has been for them.